Nothing worth doing with kids is ever easy. That’s the quote, right? If it isn’t it should be. We love our kids, but it’s hard work chasing after them all the time. Even the ones who aren’t running away are exhausting! And even though we’re not going to get a break, it’s really nice taking our kids on holiday. We get to show them the rest of the world and introduce them to new cultures and activities. That sense of wonder when they experience something new is everything. To give you a helping hand as you wrangle the kids, whether they’re 15 months or 15 years old, we’ve rounded up some of the best sites and activities for them to enjoy. To find out where to go, scroll down or click the link that best matches your kids’ ages below! What: Want to give your child a learning experience while away? You can drop the little ones off at a one-hour or more class/daycare. The Garden Early Learning Centre holds fun sessions like music and sensory class, cooking, gardening, and lots of play time. No reservations are needed, and they take care of meals too. The centre welcomes children from 18 months old. Children under 2 must be accompanied by an adult. What: It’s a playground, pilates studio, and cafe, all in one! The playground is designed to meet Australian safety standards, because, when it comes to your little ones, safety comes first! The Joglo also holds Little Picasso art classes, like clay pottery lessons every Tuesday from 4:00 PM, so kids can get stuck into some dirty/creative work. They can even meet some local animals! Food options at the cafe range from local cuisine to Mediterranean dishes. What: If the kids aren’t content with the beach, you can take them to Waterbom, Asia’s biggest waterpark. The park offers tons of different rides for the kids including a lazy river, plenty of pools, tons of slides, and a surfing flow rider. What: Little and big kids at heart will love this world-class sports and leisure complex. It’s home to a water park, trampoline centre, bowling alley, fitness centre and even a spa. So you can go off and do your thing, while the kids do theirs. What: If you need something a bit more natural than waterslides, take the kids out to see the rice terraces in Ubud. The rice terraces are steep and narrow, so you’ll have to watch out for younger kids, but the older ones will enjoy teetering along the edge as you breathe in the beauty around you. After you’re done exploring, spend an hour or two having lunch or dinner in the surrounding restaurants. 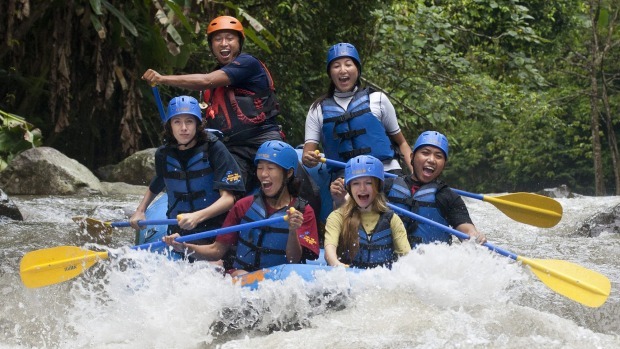 What: Get your adrenaline pumping with a white water rafting adventure down the Ayung River. Not only will you have the chance to send your kids overboard (sometimes they deserve it), but you can explore waterfalls and swim in calm waters. What: A big Bali highlight is the waves, so why not teach your teen a new skill that they’ll love and love to tell their friends about. You can get surf lessons for all skills and ages in Bali. For beginner lessons, we prefer sticking to the waves in Kuta and Canggu. What: At this equestrian club, older kids can take up their first ever horse riding class and younger kids (3-6 years) can enjoy a pony ride. And If your horse-obsessed child really wants to, they have day camps too. If your kids are a bit more experienced, there are also dressage and show jumping lessons. The Bali Equestrian Centre has a restaurant, pool area and playground so you can sit back and relax while the kids ride around in circles. It is also surrounded by rice fields and a local village, so you’ll get the best of all worlds. What: Just because you’re out in Bali for fun doesn’t mean you can miss out on some of the island’s cultural gems. Tanah Lot sits on a rock in the sea, accessible to visitors only when the waters are shallow enough to walk through. It was constructed by a priest named Nirartha in the 15th century who spent a night on the rock and then asked local fisherman to build a temple there. In the 90s, the temple underwent a multimillion-dollar restoration to keep it from falling into the sea. Crossing out to the temple is a pretty glorious experience, no matter how old you are.